This Mothers Day send something a little different. We've turned your message of love into a unique piece of art. 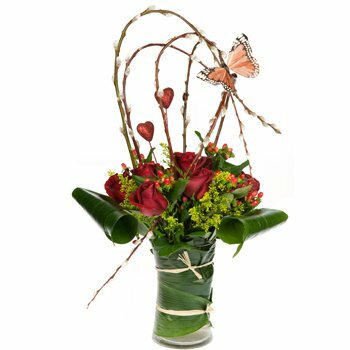 Your loved one will receive an arrangement of delightful deep red roses tucked into a classic vase decorated with vibrant green banana leaves and accented with shoots of salix, a charming butterfly, and decorative hearts all fashioned to look like a basket. The Vase of Love Bouquet is the perfect offering for romantic evenings, anniversaries, or birthdays.